When you put food on the dinner table, it is often an aromatic, delicious representation of the cooking process. What some people don’t realize is that the actual process of cooking the food is not always as aromatic as the finished dish. Cooking some foods creates odours. Some cooking processes can fill the air with smoke or make it heavy with grease. The good news is that there is a simple contraption that you can use to fix this problem—a cooker hood. Cooker hoods can be installed in any kitchen. They can prevent bad odours, keep greasy stains from mucking up your walls, and make the cooking experience more pleasant. As something that will be a fixture in your kitchen for years to come, making a purchase is a big decision. Here are some of the best cooker hoods to get you started, as well as a guide that can help you choose the right exhaust system for your stove. Which Product to Go for? 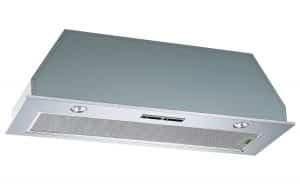 This cooker hood is a larger unit, great for large kitchens or large stovetops. It is big enough that it can work with a 90cm hob and effectively removes 700 cubic metres per hour of steam, odour, and grease from your kitchen. It comes with a washable aluminium grease filter and a slider control that lets you switch between its three power settings. With its high power, it can be installed directly into the ceiling, or you can position lower above the stovetop. This is complimented by its island-style design. Another advantage is the 2 40-watt lights, which are bright and functional. It can be used for extraction or recirculation, but you must buy a carbon filter or ducting kit. One disadvantage of this kitchen extractor fan is its noise level, but this is expected from such a powerful unit. The second is the location of the on/off switch for the light, which is behind the unit. This sleekly designed unit features an angled design. It is black in colour, with the options of red, green, and blue lights for edge lighting. Additionally, it has two lightbulbs that will improve the light in your cooking space. You can install it as recirculation by purchasing additional charcoal filters, or using extraction buy purchasing a ducting kit. This sleek, functional design becomes at a fair price that is just a little more expensive than the previous model. Inside the unit, an aluminium grease filter traps oily residue that would normally build up on your walls and in your cooker hoods. It is easy to remove and clean, and it is also dishwasher safe. It has the standard three speed levels and push button controls. One downside is the buttons are not located in the most accessible area, because they are on the top of the unit. This stainless steel extractor hood has the option of being extraction or recirculation, but you must purchase a duct kit or charcoal filters. It features the standard speed settings and works well for medium-sized kitchens, being able to extract 400 cubic metres of air. You can turn the light on or off, as the unit features 2 very bright LED bulbs. A major benefit of this hood is that you can switch between extraction and recirculation with the push of the button, as long as you purchase the filters and the ducting kit. The included filter is dishwasher safe. If your kitchen is the appropriate size, you will appreciate that the unit is wall mounted, so it does not have to go directly above the stove if you do not want it there. Even though it is powerful, it is not loud. However, it will also not work in a kitchen that is too large. This model, like other Island style cooker hoods, has a sleek, attractive design that you will appreciate in your kitchen. Though it has a higher cost than the other models on this list, it is highly effective and extracts up to 700 cubic metres per hour. It has an average noise level, on all three of its speed settings. This unit is made to be installed into the ceiling, but it is heavy and some ceilings may require extra support. Because of its large size, you may need 2-3 people to install it, especially when attaching the hood to the frame. This model also comes with 2 washable grease filters, 4 bright Led lights, and a 1-year manufacturer’s warranty. The warranty is nice, because it will ensure the fan is in proper working order before you commit to it in your kitchen. 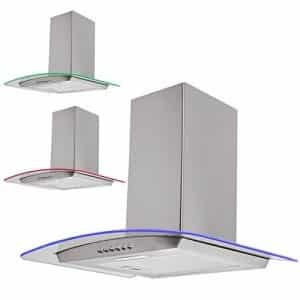 This chimney extractor fan is stainless steel and bright, with a curved, tempered glass hood. It extracts 550 cubic metres per hour and mounts directly above the cooker. It extends to the ceiling and outside, to effectively remove grease, steam, and odours from your kitchen. It comes with a 12-month guarantee. In the unit, 2 washable aluminium filters keep grease from ruining the inside of your unit. They are easy to wash. There are two 2-watt LED lamps, but they are a little dim. Another major advantage of this unit is that there are no extra purchases—you just run the extractor to the outside of your home and it does its job. The weight of this hood is disadvantageous because you may need to use a drill to fix the heavy extractor to the wall. Additionally, the instruction manual has spelling and grammar mistakes but once you look past them, install is fairly easy. This unit has a discreet design, being only 60 centimetres and much smaller than the others listed so far. It is made of stainless steel and offers a flexible install, using a top or rear duct for extraction. Even with its small integrated cooker hood design and flexible install, however, it can be bulky looking if it is not installed with cabinets. While it does cost half the amount or less compared to the others on this list, it also has a lower extraction rate of 250 cubic metres per hour. However, being installed directly over the stove, it will still work well for a small kitchen. It is quiet and features three power settings, with buttons that are clearly labelled. This unit does have a short power cord, which can be a problem depending on outlet placement in your kitchen. The 1-year warranty, which is nice, is also tricky to set up because of the small print and specifics on the site. This kitchen extractor fan has an excellent warranty, with 5 years on parts and 2 years on labour. It is stainless steel with a glass extractor, and styling edge lighting in red, green, or blue. In addition to the edge lighting, there is an LED lamp with an on/off switch separate from that of the edge lighting. There are six easy-to-access buttons on this unit, four for the speed settings and one each for the types of lighting. It has an incredibly effective aluminium grease filter, with four layers, that are still easy to clean. They can even be cleaned in the dishwasher. It extracts 400 cubic metres of air per hour. To install, you will need to purchase a ducting kit or charcoal filters. You will also want to make sure that the large, chimney design will fit in your kitchen. It requires 750mm over a gas stove or 650mm over an electric hob. 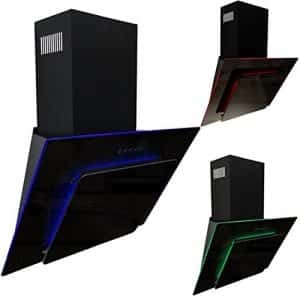 This chimney extractor hood has a stainless steel exterior that is sleek and shiny. It operates quietly and has a 12-month manufacturer’s guarantee. At the highest of its three speeds, it extracts 300 cubic metres per hour. Like many others, you will need to buy additional parts depending on if you want a recirculating or extracting unit. It works as well as more expensive models, but at a lower cost. It features washable aluminium grease filters and two 40-watt bulbs that offer great lighting for dim kitchen spaces. It is fairly easy to install, it might take a person a few hours or less. The exception is if you have a long distance between your stovetop and your outside vent, because the chimney may be a little short. Additionally, it requires larger-than-average extractor tubing, so you may need an adapter to fit the pieces together. 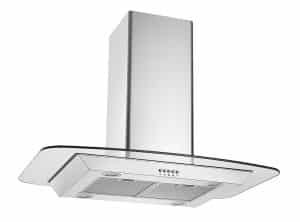 This cooker hood comes with a telescopic chimney design, as well as included recirculation filters and an extractor fan, depending on how you would like your unit set up. It is a little loud, but that is expected on a 550-cubic metre per hour extraction setting. The filters inside are aluminium and dishwasher safe, as well as easy to remove. The motor features two separate fans and three speed settings. If you use this unit as a recirculation fan, you will need to replace the included charcoal filters in six months. The lights on this are impressive—it comes with two 28-watt halogen lamps that will brighten up your cooking area considerably. It does require between 550 and 650mm above the cooking range for installation, but even with its height the buttons are easy to access. 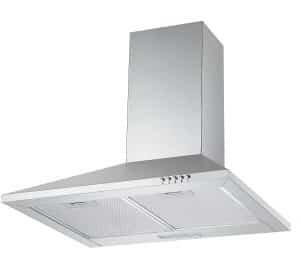 This chimney kitchen extractor fan comes with the standard three speeds and 12-month warranty. For a large, chimney-style, its design is sleek, elegant, and classy. It is adjustable, allowing it to fit into spaces between 573mm and 940 mm, making it taller than any other unit and perfect for kitchens with high ceilings. Its included 2-watt LED lamp works well and will light up your cooking space. At its highest extraction rate, this removes 380 cubic metres per hour. However, it is a little noisier than other units that do the same job. It comes with an included ducting kit for extraction, but with the purchase of carbon filters, you can make this a recirculation unit if you would like. The outside of the unit comes with a protective plastic coating that you can remove, but if you touch the unit with greasy or dirty fingers, it picks up dirt easily. 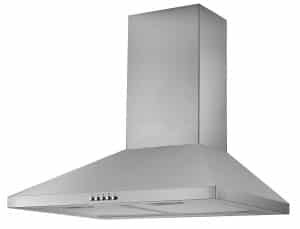 This adjustable chimney cooker hood can be positioned between 580 and 850mm and extracts up to 450 cubic metres per hour, at close to the same price of the previous unit. It has a sleek, stainless steel finish and 2.5 watts of bright, LED lighting. Additionally, there are two washable aluminium grease filters inside the unit. Outside, the buttons are prominent, easy to push, and clear to label. It comes with a long power cord for easier installation and while the install takes time because of the size, the unit comes with good instructions that make it easy to install. For the most part, the unit is quiet. However, the walls seem thin on the unit and the motor causes them to vibrate when the fan is on its highest power setting. 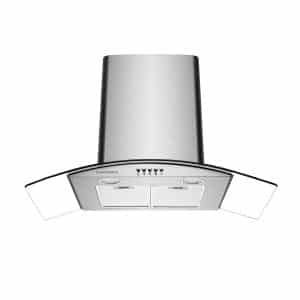 This chimney-style hood has a sleek, stainless steel finish with a curved glass hood. It has three speeds and two 2-watt LED lamps. It is the tallest option if you have a high ceiling compared to others on this list, with a height between 560mm and 1040mm. The filter is washable and easy to remove, so keeping the inside clean is simple. The unit is a little heavy, but is otherwise easy to install. It has an included ducting kit for extraction, but you can choose recirculation by purchasing extra carbon filters. Even on its highest setting, this unit is quiet. If you find you have any questions, the Ciarra customer service team is quick to get questions answered. Another advantage is that the extractor can have above or semi-rear venting, at a 45-degree angle from the top. Best quality & features – Ciarra CBCS6506B – This unit is the best because if you do not mind a heavier unit, it is the most flexible for install. It operates quietly and effectively, and includes a ducting kit. On a budget – Cookology CMH605SS – This unit is ideal for people shopping on a budget. It may require extra parts, but it will still cost less and work just as effectively as other units. The lightest option – Igenix Visor Cooker Hood Extractor – Though a little clunky looking, this integrated cooker hood is lightweight and efficient. 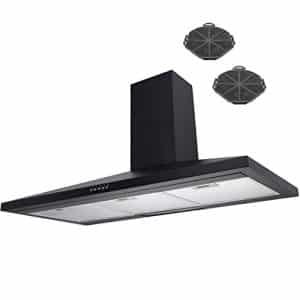 For small spaces – Cookology BUCH900SS Cooker Hood – Even though this works by removing up to 700 cubic metres of air, this unit is small and easy to install. 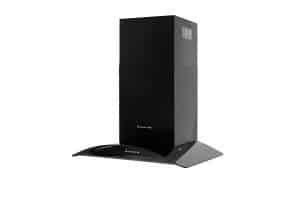 It fits into small spaces, despite its ability to work in a large kitchen. 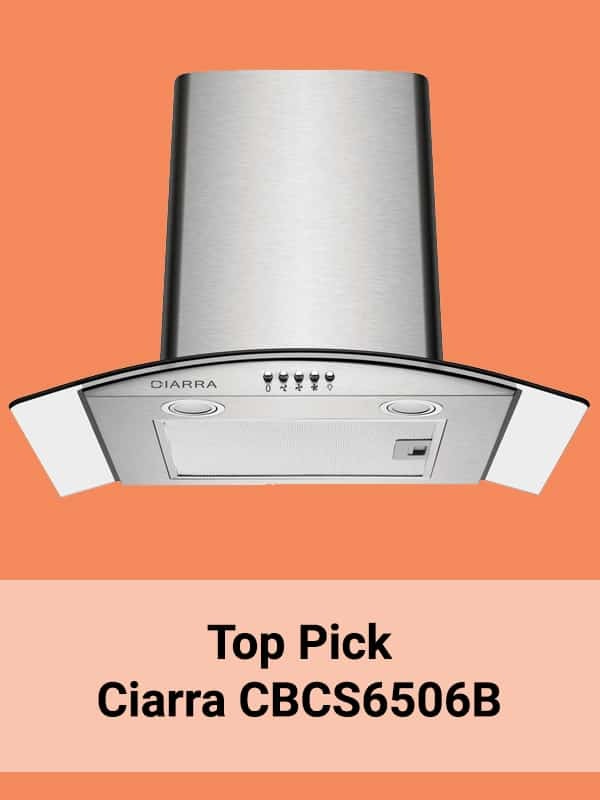 For a guaranteed fit – Ciarra CBCS6506B – This model is adjustable between 560mm and 1040mm, so it is great for high ceilings. However, it also works for smaller spaces. 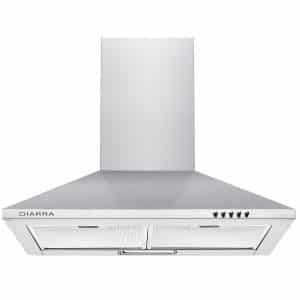 Cooker hoods are something that often come with our homes in the purchase. Their long life means that many people looking to buy a cooker hood are first-time buyers. When you are thinking about how to choose an exhaust system for your stove, the first thing to do is be knowledgeable about your upcoming purchase. Before making your decision, consider the following things. There are several varieties of hoods for over your stove, but all of them are either extraction or recirculation hoods. Extractor hoods work by pulling greasy and odorous air in through a filter. Then, the air travels through a duct and is released outside of the home. Recirculation hoods pull the grease and fumes through charcoal filters. The air is cleaned before being cycled back into the home. Both types of models can be efficient. The difference between recirculation hoods and extractions is primarily the way that the air is dealt with after being directed into the vent. If you want easier installation, consider if there is access over your stove to the outdoors. If not, choose a recirculation hood. Conventional- These are usually built for use with a four-burner stove. They are typically the most affordable model and come in two standard sizes- either 60 or 90 centimetres. The duct can be located on top of the hood or on the rear side. Island- Island hoods are the largest offered, often having a stylish design because of the attention they attract in the kitchen. They are attached to the ceiling and allow cooking smoke, grease, and odours escape to the outdoors. Canopy- These hoods are often discreet because of their design, which is compact enough to fit on the underside of your cabinet. These are often high-tech, featuring optional settings that let you control how the hood works. Integrated- There is a similarity between the integrated cooker hood and canopy-style, because they fit seamlessly into the space in your kitchen. These hoods are not compact; however, they are covered with a cabinet panel. It will sit between two existing cabinets. These are highly compatible, because they come in many sizes. 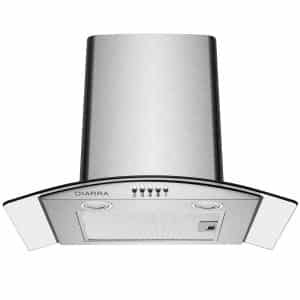 Chimney- Chimney hoods are most commonly made of stainless steel. They use a glass canopy that catches steam, before transporting it up a telescope-like tube that exits through a duct in the ceiling. Downdraft extractor- This is a more expensive hood option, but it has a minimalist design that some people prefer for their kitchen. It works well for islands and can easily be stored when you are not using it. Regardless of the cooking hood for your stove that you choose, a filter is used to clean the air before releasing it outside or recirculating it back into your home. Filters are commonly made of stainless steel, aluminium, charcoal, paper, or fleece material. Regular cleaning is necessary for metal filters, while charcoal, paper, and fleece filters need changed regularly. You should consider how easy or hard it is to remove the filter, as well as how costly it will be if it needs replaced. Follow manufacturer’s guidelines for cleaning and replacement to keep your hood running smoothly. Extraction rate- The extraction rate describes how quickly cooking fumes are removed from the kitchen. To find the rate that you need, find the volume of the air in your kitchen by multiplying the length and width of the room by its height. Then, multiply the resulting number by 10. This should be represented in metres cubed per hour. Size- For a cooking hood unit to be effective, it needs to be at least as large as your stovetop. Most of the fumes created cooking rise directly up, so a hood this large will trap the most fumes. As you consider size, you should also consider how much space you have in the area you will be installing the unit. Noise Level- One thing that people sometimes forget to think about is how loud the hood they choose will be. If you listen to music or talk to your family while cooking, then you will want to choose a quieter model. Lights- A cool feature that most If you have a dimly lit cooking area, use this purchase as an opportunity to upgrade your kitchen lighting too. Access of Controls- It can be annoying and even difficult to access the power controls of some units. Look for models that have buttons that are easy to reach, either on the front or visible on the side of the unit. Power Settings- Some foods are known for the off-putting odour they produce while cooking. If you frequently cook smelly foods like liver or fish, you may want to consider a model with a high-power setting that you can turn on while cooking these types of foods. The easiest way to find the best exhaust system for your kitchen is to consider your own personal needs. Choose a cooker hood that fits in with your personal style, is compatible with the layout of your stove and kitchen, and functions how you want it to within your price range. By following these guidelines, you will find the perfect extractor hood for your cooking style.